Fall is here, and your garden has just about all gone dormant. It’s now useless until spring, right? Wrong. Why not turn your garden into a haunted attraction and use it to entertain the neighborhood kids? Sound like fun? It’s easy to convert, too, so here are some elements you should include. Spider Webs – One of the easiest ways to haunt your garden is to add fake spider webs. Take a generous amount of fake spider web material and place it over your larger, sturdier dormant plants. This will give your garden an old, neglected feel, and when it’s dark out, it will appear ominously creepy. 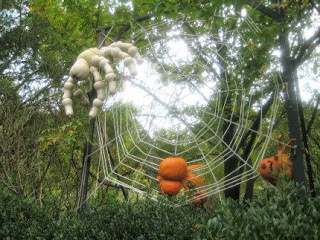 Adding spider webs is one of the easiest, quickest, and cheapest ways to make your garden a creepy attraction. Scarecrow – Okay we know that your garden isn't a corn field, but that doesn't mean you can’t add a scarecrow, or two, if your garden is large. Scarecrows have been given a haunted rep and even innocent looking ones can look menacing and sinister at night. The creepier the scarecrow, the better. Build your own or purchase one from a Halloween store and hide him among your spider web-covered plants. Music – Another way to give your garden a creepy vibe is to play Halloween sound effects or music. As the neighborhood kids weave their way through your garden, the hair on the backs of their necks will stand up as they hear footsteps approaching, screams in the distance, and the whine of a chain saw coming from your hidden MP3 or CD player. Get Involved – Are spider webs, scarecrows, and scary music not enough to make your garden the scariest on the block? Well, get involved! Put on a creepy outfit and hide among your garden plants. When the kids walk by, jump out and scare them silly. Get the entire family involved, and soon, kids will be lining up to walk through your creepy Halloween garden! On a side note, we recommend that you continue watering your garden using a drip irrigation system so that your Halloween decorations don't get soaking wet.